The viola part for Enescu's Romanian Rhapsody No. 1 in A major, Op. 11 has been edited by Israeli-born Yizhak Schotten, an internationally acclaimed musician whom STRAD Magazine has called "one of America's finest viola players... a leading light of the U.S. viola establishment." Schotten's bowings, fingerings and other editorial markings have been added throughout the score. The two Romanian Rhapsodies for orchestra are George Enescu's best-known compositions. Dedicated to the composer and pedagogue Bernard Crocé-Spinelli, Enescu's Romanian Rhapsody No. 1 is ebullient and outgoing. It begins with a folk tune quotation. As the work progresses, this tune grows faster and livelier to climax in a vibrant whirling folk dance. The Rhapsodies were first performed together in 1903. Since then both rhapsodies, and particularly the first, have held a permanent place in the repertory of every major orchestra. 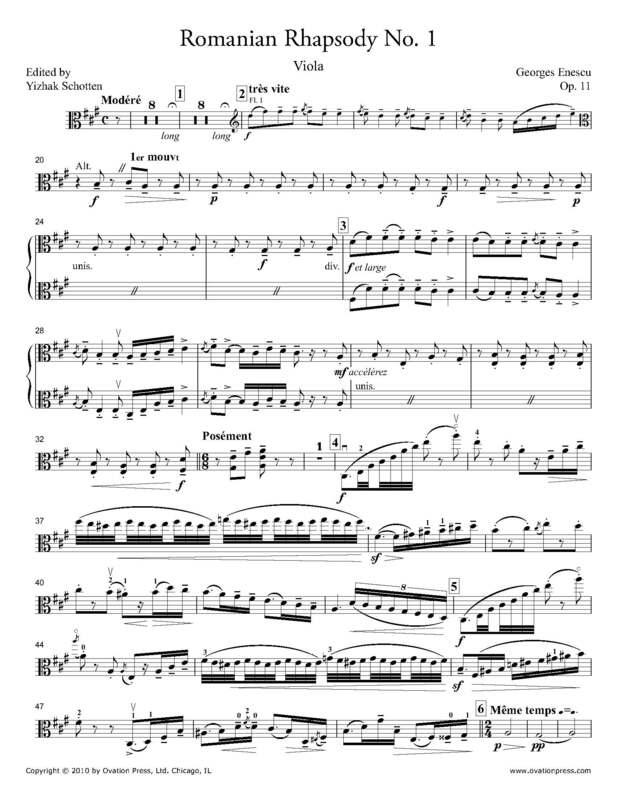 Download and print the score today to gain access to expertly edited Enescu Romanian Rhapsody No. 1 viola fingerings and bowings from Yizhak Schotten!